I’m a relatively new Dad so this is all a bit fresh for me, I have a beautiful 7 month year old daughter called Jasmine. What’s it like? -I guess like every Dad might say, “its fu*king amazing, incredible, exciting, learning, heartwarming, loving.” She’s the best thing ever. I adore her. Not much to report after 7 months. I’m happy that she thinks that everything I do is hilarious…I guess I should enjoy the moment! Private time with my wife, our life changed but it’s important to still enjoy what we had. 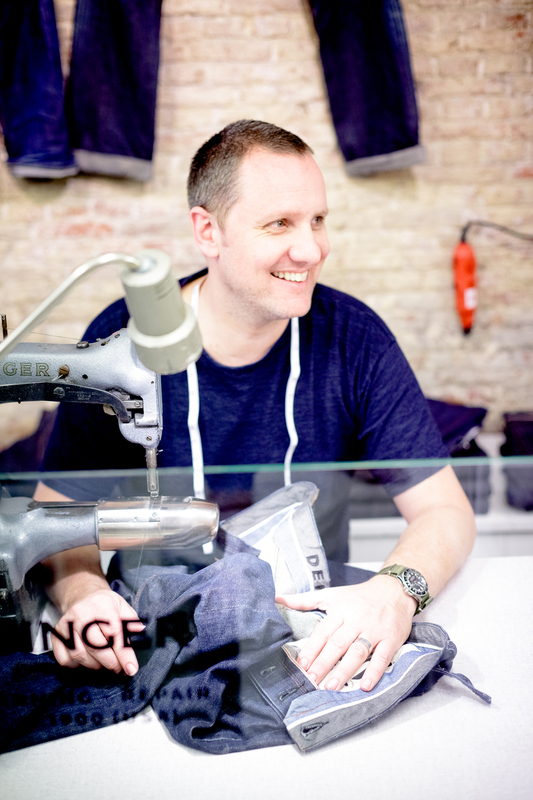 You are known in the European market as the consummate “jeanmaker”. Talk to us about the Denham brand. I love Jeans, I’ve been involved in the denim business all my life. I started DENHAM (My signature brand) six years ago. We’re based in Amsterdam and we sell in 22 countries mostly in Japan, Germany, the UK and the Netherlands. In spring 15 we will start selling at Barneys New York & LA. We make full collections for mens and womens including every category, Jeans, Outerwear, knits, sweats, tees, etc, etc..
Every Hip Daddy loves a great pair of denim. Talk to us about your own personal stye. I wear Jeans everyday, mostly a skinny selvedge – a crew neck black tubular tee and a pair of Jack Purcells. Any particular clothes/brands you like to dress your kids in? My wife loves Petit Bateau and I love a Japanese label called Dungerees. What’s the perfect weekend with the kids look like? Sleep in till 7, then breakfast (my wife’s Egg special), walk the dog (“Norton” the big brown Lab) shop at MARKT (great organic supermarket). I also enjoy meeting friends in local bars, taking in movies, cooking amazing food, and enjoying some nice wine…wind down and recharge the batteries. How do you manage the responsibilities of running Denham with the home duties of being a Father? Being a father has trained me to be more efficient than I was before. I manage my time better. I think they call it “the art of delegation!” I finally learned it! For more on Jason, follow him on Instagram here and Twitter here.